Acini di pepe [ˈaːtʃini di ˈpeːpe] are a form of pasta. The name is Italian for "seeds of pepper". Acini is the plural of acino whose root is the Latin word acinus. In both Latin and Italian, the word means "grape" or "grape-stones". The "stones of a grape" are, of course, the seeds of the grape. Acini di pepe then translates into "seeds of a pepper". They were and are known as a symbol of fertility, which is why they are used in Italian wedding soup. They are also sometimes referred to as pastina (Italian for "tiny dough"); however, some pasta makers distinguish pastina as smaller than acini di pepe. The individual pieces usually resemble tiny cylinders about 1mm, or less, in each dimension. Acini di pepe work well in soups and cold salads. 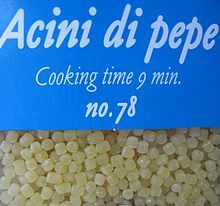 Acini di pepe are often used in Italian wedding soup. Frog's eye salad is an American cold salad that combines the pasta with whipped topping, marshmallows, pineapple and mandarin oranges. A similar starch found in Palestinian cuisine is called maftool or maftoul. It is hand-rolled by professionals in large clay pans. Maftoul is a wheat-based dish that is somewhat served like couscous (or Moughrabia as it is known in Lebanon and Syria), with whole black peppers, dried cloves, onions and chickpeas or tomato sauce. Maftool, like most couscous dishes, is served with chicken. ^ Albala, Ken, ed. (2011). "Palestinian Territories". Food Cultures of the World Encyclopedia. Santa Barbara, California: ABC-CLIO, LLC. p. 285. ISBN 978-0-313-37626-9. This page was last edited on 4 April 2019, at 15:23 (UTC).